The project focuses on the four main residential neighbourhoods of the late Hellenistic city of Delos to examine urban development in relation to economic changes. By analysing the transformation of the residential neighbourhoods of Delos in relation to manufacturing activities, shopping and storage facilities as well as the construction of public buildings, the project examines the neighbourhoods as microcosms of the broader changes Delos underwent during the late Hellenistic period. The field of urban studies in the Hellenistic period is currently dominated by two major trends. On the one hand, research has concentrated on aspects of town planning, characteristic urban architecture and physical infrastructure. On the other, work has tackled cities’ organisation, economy and political administration, including the crucial role of benefaction. Whereas studies on Roman urbanism have combined these two key approaches by relating urban form with economic developments, public administration and private initiatives, there has been no similar effort for the study of the Hellenistic city. More recently, projects on the Hellenistic city aim to address the dynamic character of urban space in classical antiquity and the socio-political factors that inform it (e.g. the DFG Research Project Die hellenistische Polis als Lebensform). These studies examine the multivalent character of urban form as well as the socio-political structures and institutions in ancient cities. However, they still focus on the idealized concepts of the Hellenistic and Roman urban environments, such as monumentality, planification and axiality, and do not examine the ways in which activities in the micro-scale of the city shape its macro-scale. My project aims to complement these studies by offering a multidisciplinary approach to urban growth in the Hellenistic world. In particular, my goal is to evaluate the ways in which uncontrolled factors, such as micro- and macro-scale economic and social developments, fit in our understanding of urbanism in antiquity. To put it differently, the project addresses the relations between the forces that shaped urban growth – such as economic activities, public administration, private initiatives, cultural and religious diversity – and major urban components – for instance, architecture, landscape, infrastructure – of the city on Hellenistic Delos. A study that relates urban form with economic developments, public administration and private initiatives requires detailed information on the organisation, economy, and administration of a city as well as a good state of preservation of its physical remains. The Hellenistic city of Delos is a unique site for such a study: its buildings are in an excellent state of preservation; and it has an outstanding epigraphic record, which is complemented by historical sources. Let me explain the historical point on which I am focusing. Delos, home of the sanctuary of Apollo since the archaic period, underwent a period of rapid economic development after 167 BCE, when the Romans put the island under Athenian dominion and turned it into a commercial base connecting the eastern and western Mediterranean. Due to its advantageous geographical position, Delos attracted traders from Greece, Macedonia, and the Hellenistic East as well as dealers from Rome since the third century BCE. Between 167 BCE and the sacks of 88 and 69 BCE by the troops of Mithridates and the pirate Athenadoros, the island—though primarily addressing the regional market of the Cyclades—became an intermediary step in Rome’s commercial relations with the Hellenistic east. The accelerated urbanisation—attested by the formation of new neighbourhoods—and the maelstrom of redevelopment in the existing urban and port areas of the island—as seen in the massive constructions of jetties, docksides, warehouses and markets —were the result of this economic development and the unprecedented demographic growth and cultural diversity that it generated. The project focuses on the main residential neighbourhoods to examine the urban development in relation to the economic activities as well as the public and private initiatives. By analysing the transformation of their built environment in relation to manufacturing activities, shopping and storage facilities as well as the construction of public buildings, the project examines the neighbourhoods as microcosms of the broader changes Delos underwent during the late Hellenistic period. The examination of the residential neighbourhoods as microcosms of the economic and urban developments that Delos underwent during the Hellenistic period will be achieved in the following ways. First, the project will examine the organisation and function of the neighbourhoods in relation to the public buildings (such as gymnasium, stadium and theatre), manufacturing installations, storage facilities and shops situated in them as well as their relation to the port facilities. This will be achieved by the analysis of the epigraphic evidence related to the construction of public buildings and of the manufacturing activities, shops and storage facilities in relation to the development of the neighbourhoods. These analyses will lead to an assessment of the ways in which economic activities as well as public and private initiatives affected the evolution of the neighbourhoods over time. 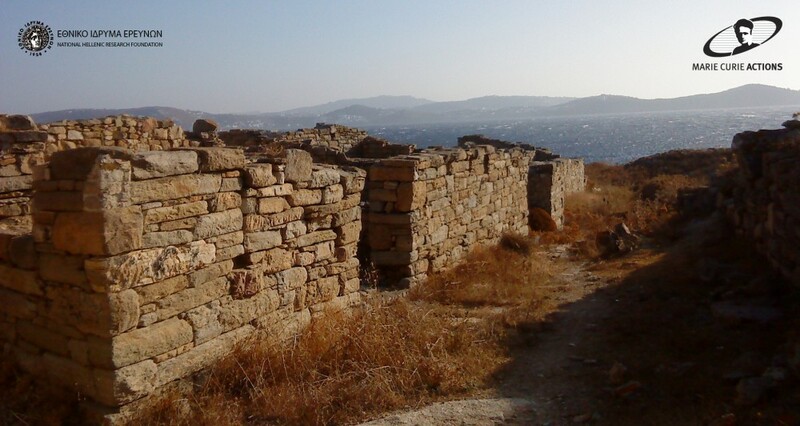 In doing so, the project aims to evaluate the character of the rapid urban development on Delos in relation to the economic changes of the period. Second, the project will develop a 3D digital model that will present the existing state of the neighbourhoods’ structures and will use quantitative methods and statistical analysis tools to address the research questions of the project and propose a reconstruction of the neighbourhoods. The model not only aims to systematize the archaeological information and reconstruct the built structures, but also to tackle the research questions addressed in the project: the ways in which new structures were related to pre-existing ones, how their internal organisation evolved, as well as the relation of the neighbourhoods to the topography of the site, the port facilities and the older neighbourhoods. The model will offer the unique opportunity to visualize architectural change in relation to social and economic factors over time. In this way the project aims to create the model as a showcase for the ways in which a variety of archaeological information can be visualized in order to facilitate research questions in this field. All parts of the analysis aim to understand and analyse the ways in which a variety of forces—social, economic, political, among others—shape the ancient built environment over time. In doing so the project will I hope enable us to recognize the relation between urban form and economic developments, public administration and private initiatives in the Hellenistic city of Delos. Finally, although this project focuses on a specific case study of urban growth, its ultimate goal is to offer an alternative approach to the understanding of urbanism in antiquity. The rapid urbanisation of Delos may be compared with far more accelerated developments of growing commercial centres of Asia and the Gulf Region. Urban studies today recognize what may be termed as “a disciplinary paralysis” to sufficiently describe, let alone influence, the accelerated urbanisation in developing regions of the world and the rapid redevelopment in existing urban areas. This project has the advantage of focusing on an early phenomenon of rapid urbanisation, during a period that is well attested in the written and material records. By examining the evolving agents, relationships and consequences of the rapid urbanisation on Delos this project will identify a model of urban growth that to date has been overlooked in the study of ancient cities that have focused on the idealized concepts of the Hellenistic and Roman urban environments, such as monumentality, planification and axiality. This alternative model of urban growth is indeed the dominant one for contemporary urban studies. Analysing a historical paradigm of such a model can only bring better understanding of the factors that shape the modern city today.